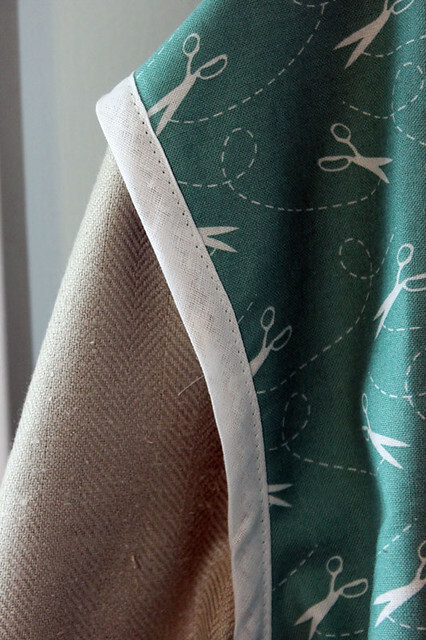 Last week I ventured over to Grey's Fabric for the first time, and met the lovely Sarah who showed me where she was on her Victoria Blazer from By Hand London. And after I saw it, I had to take the pattern home and give it a go myself. I had already made a skirt and a pair of pants with this silk twill fabric, and I still had a little bit left - just enough for the cropped version. 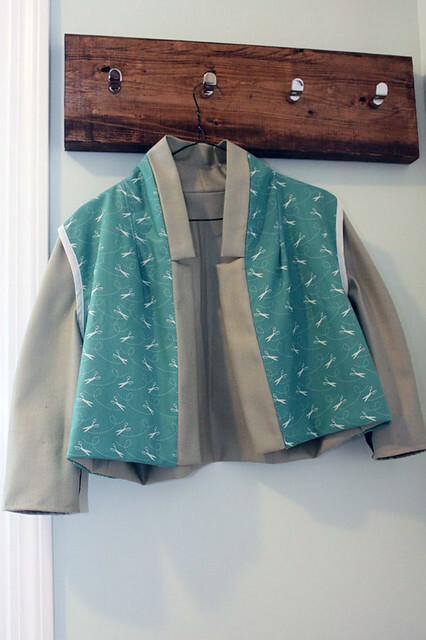 I've been wanting a cropped jacket for a while, and this one went together quite quickly - in 3 hours in fact (well, 3:15 if you include the time needed to handsew the lining closed)! I lined it in a teal quilting cotton with sewing scissors decorating it. The skirt is self-drafted, based on the No. 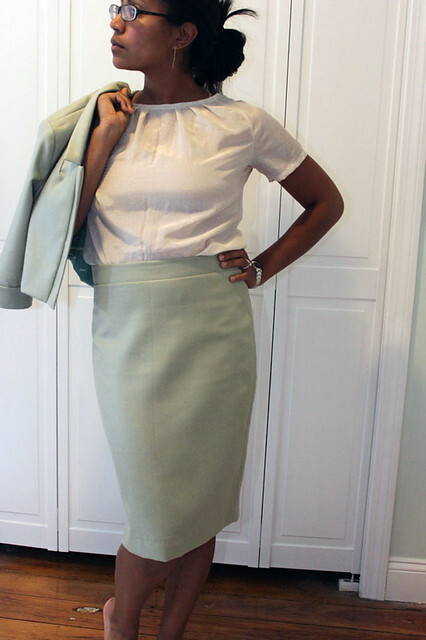 2 pencil skirt from J Crew. I love it so much, I have already made four of them. I make another one whenever I have some nice fabric leftover. The blouse is also self-drafted, based on my raglan sleeve blouse pattern that I have shown here before. This version is made from a silk batiste. 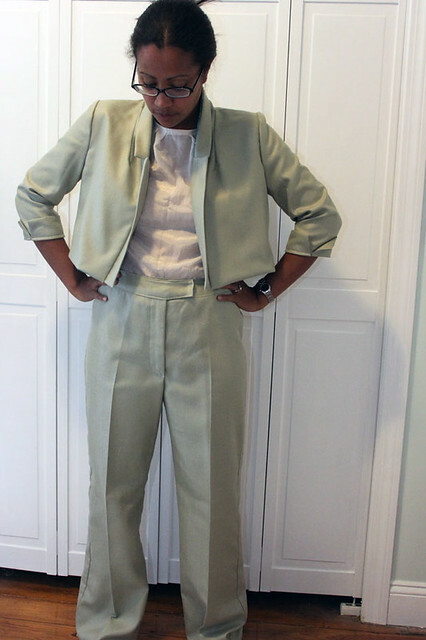 The jacket calls for the sleeves to be left unlined, which I did. But instead of finishing the armhole and lining separately as suggested in the pattern, I basted the armhole and lining together and finished them as one with bias tape. I think it looks much nicer this way. 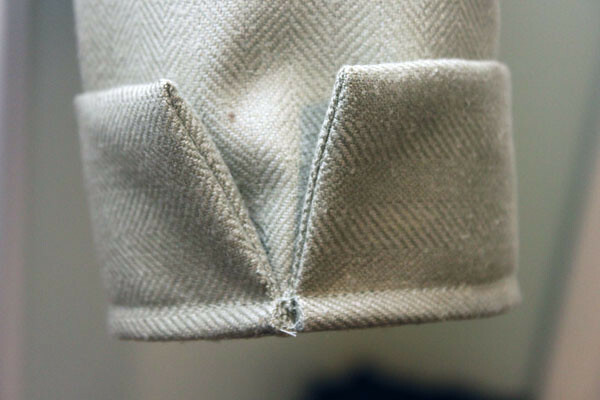 While we are discussing the armhole, I loved that there were lots of notches on the pattern to make sure the armhole was lined up properly! I think everyone should include more notches on their patterns! Here is a closeup of the lining print and the armhole. And here is the collar and lapel. It is super easy to get nice sharp corners on these pieces since they were drafted along the fold. 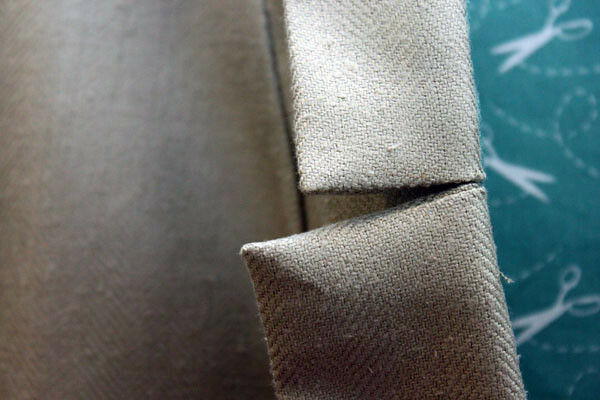 The sleeve cuff is finished with a french seam, the first I have seen quite like this. It was easy and effective. Bravo By Hand! 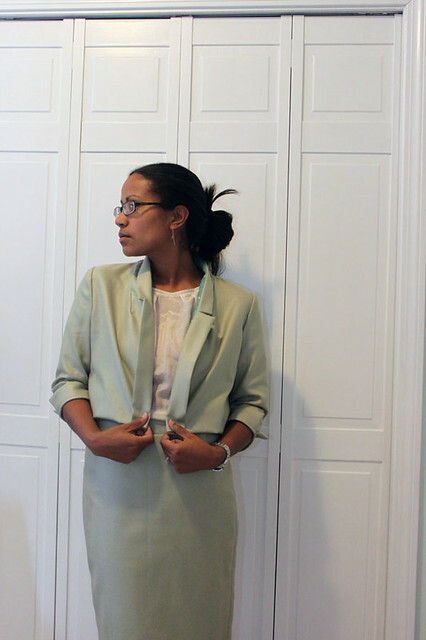 Here is the blazer with a pair of matching pants - I made these as a wearable muslin of Vogue 7881 - a Claire Shaeffer pattern. The fit is pretty good, and the instructions are impeccable. This was my first time easing in the front and back pieces into the waistband instead of putting in darts. I have already adjusted the pattern for next time, to remove a bit of ease in the front crotch area and to lower the waistline an inch. But I have a feeling that these pants will get quite a bit of wear in the meantime (though maybe not with the blazer). 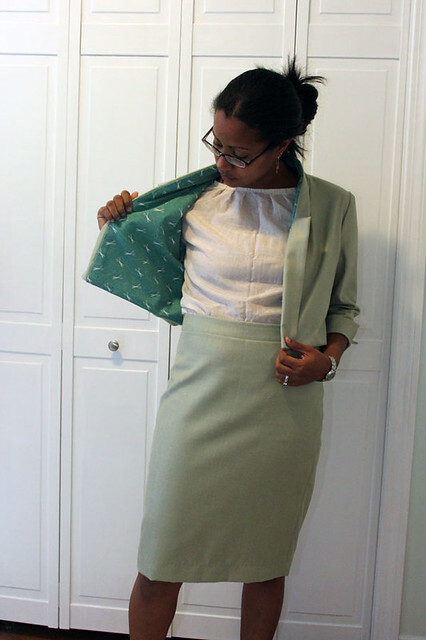 All in all, I ended up non-intentionally creating an entire suit in this fabric - and I really love all the pieces! I might try to make a few adjustments to the Victoria blazer pattern for the future - mostly to try and get the collar to lay flat. 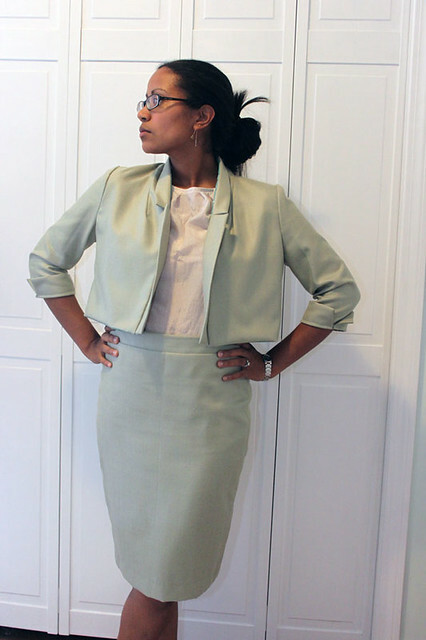 But I do recommend it to anyone who is intimidated to try making jackets or blazers - this one is a breeze! I like how you've made and finished this blazer. It's a great colour and the lining is really cool. First off, your clothes are amazing! Super talented, you are! 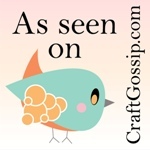 I quilt but your blog is so inspiring, would love to attempt a shirt or a maxi skirt. My question is...what is a princess seam? Oh another question...do you use a serger? Or do you make all your clothes on the 201? Your suit looks amazing!! What kind of pockets did you add to the pants? Nice Silk Twirl suit! You should give a try to the indian ethnic clothing including unstitched suits online.